I absolutely love this dress. It's crisp perfection and classy without looking too old. The outfit is a mix of black and white that if both elegant and fresh at the same time. She absolutely looks like an effortless queen. 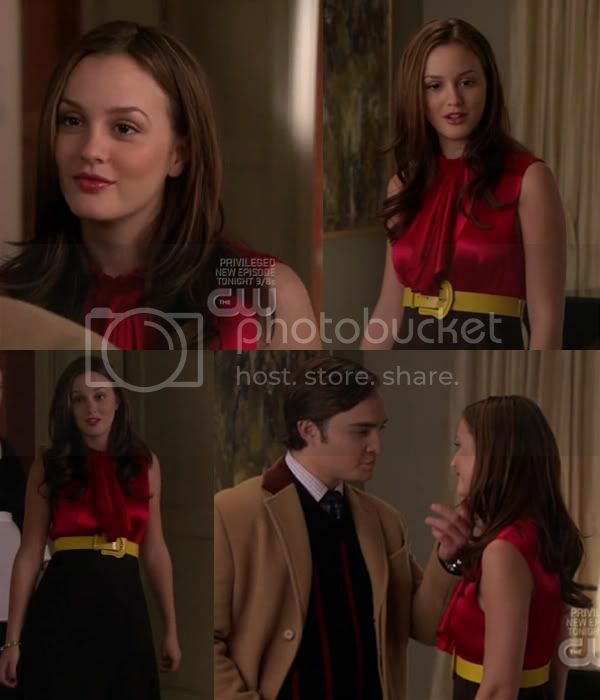 If I'm not mistaken, this is one of only two times in the entire series where Blair is seen in pants. Honestly, I don't know why, because she looks great and you need to break up the skirts and dresses everyone once in a while. The jeans and heels look great together and I absolutely love the printed top. I also like the fact that she's wearing a more casual outfit for this emotional scene; it's a little more humanizing in my opinion. Of all the incarnations of Blair's uniform we've seen (Constance clearly has a very lax dress code), this one is probably my favorite. The details really stand out here: the yellow on her jacket, the striped shirt, the awesome ivory tights, and the epic red headband. Despite the fact that these details would seem to clash, the fit perfectly together and give her a really incredibly polished and interesting look. 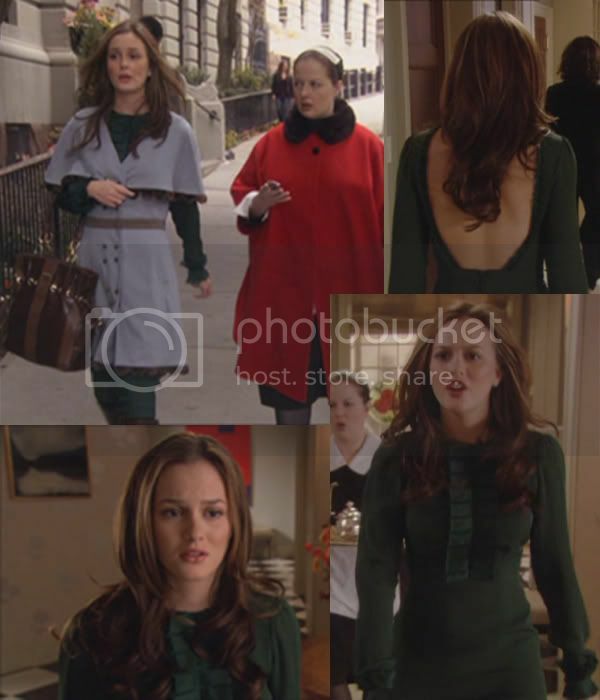 Probably one of Blair's most gorgeous looks. I really love every one of the feminine and fancy details of this look. Just perfection. I love how Blair manages to still look amazing even to go ice skating. The mix of colors in this outfit is gorgeous and I really like the skirt and cape combination, although it also looks great without the cape. Sorry you can't get a great look at this outfit, but I loved it too much to exclude. 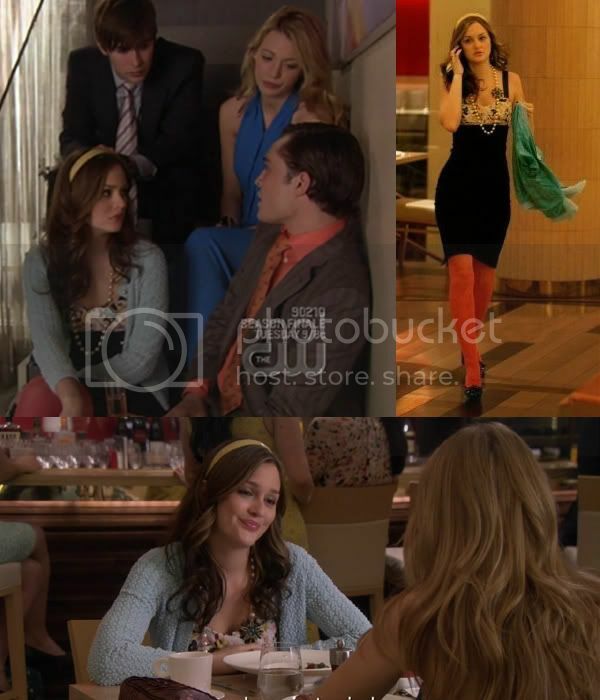 I believe this is the only other time that Blair wears pants, and once again she looks great and still very feminine. I love the shirt she's wearing and the colors of this outfit look gorgeous on her. 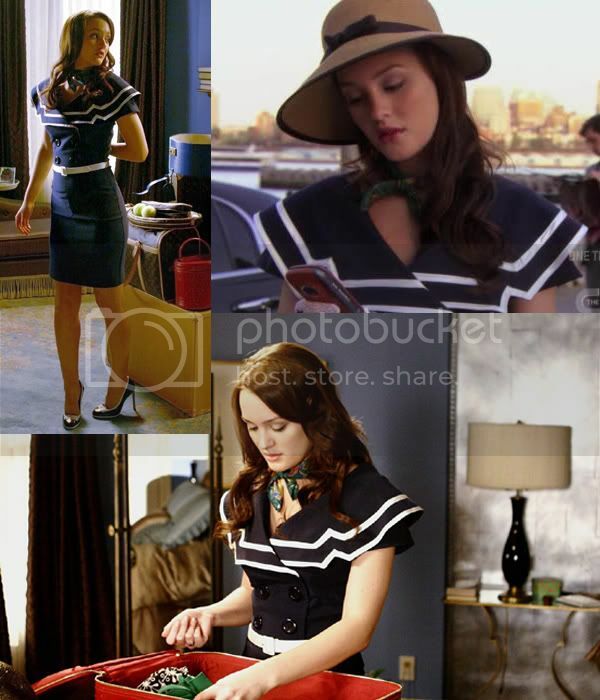 Very different from the "Victor, Victrola" version of her uniform, but absolutely love how Blair rocks the red, white, and blue so perfectly. Like the other version of her uniform, lots of great details: the cut of her jacket, the headband, the lacy red tights. And that bag is absolutely to die for. I love the blend of nautical and flight attendant in this dress, and the dress looks amazing on her. I would never travel in those heels, but they certainly are gorgeous. Not much to say other than I love the colors and cut of this dress. And, once again, gorgeous heels. Well, Chuck does have good taste. The color of the dress is really great, as is the detailing. The single embellished strap, which Blair complements with the headband, make the dress truly stand out. First of all, I must say, EPIC SCENE. Once again, Blair rocks the red, white, and blue. I love the sheer patterned top and the beautiful pattern and colors of the skirt. And, of course, I love the oh-so-helpful side buttons on the skirt. I love how gorgeously delicate this dress is, with the soft pink fabric and black lace. This dress initially looks pretty conservative, but the open back serves as a nice surprise to mix it up. I love the color and cuffs on this dress. 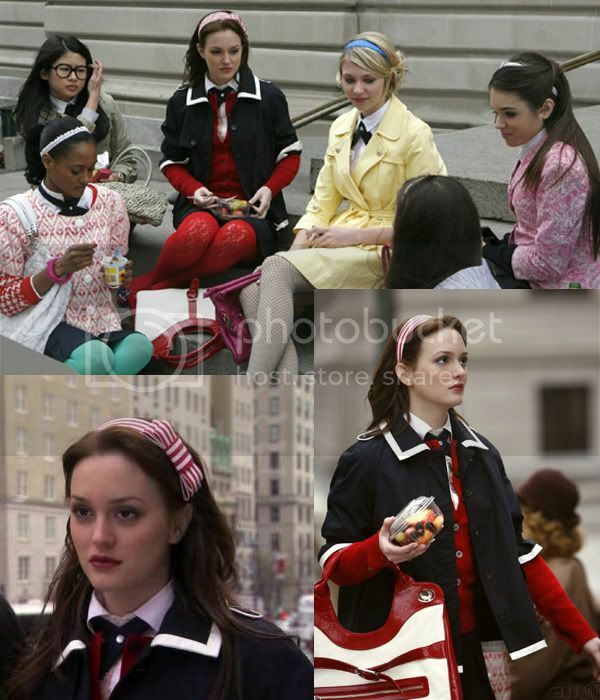 And I LOVE how the browns in Blair's jacket, bag, and boots play together so well. Great attention to detail. I like the combination of the all of the bold colors in this dress and it just simply looks great. I absolutely love this top -- it has so many exquisite details. I never would have thought to pair it with that skirt, but they complement each other very well. And look at those heels! Pretty simple: a great cut and pretty pattern on this dress. To be honest, I'm not a huge fan of her blue sweater, but I love the rest of the outfit too much to exclude it. 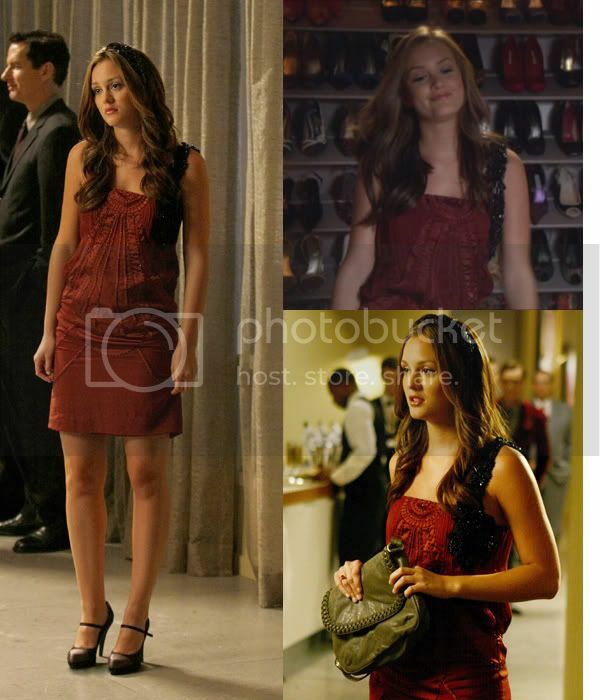 This dress looks amazing on her and I absolutely the pairing of the small flowered section with the long black skirt and how Blair uses the orangey-red tights to complement the top of the dress. 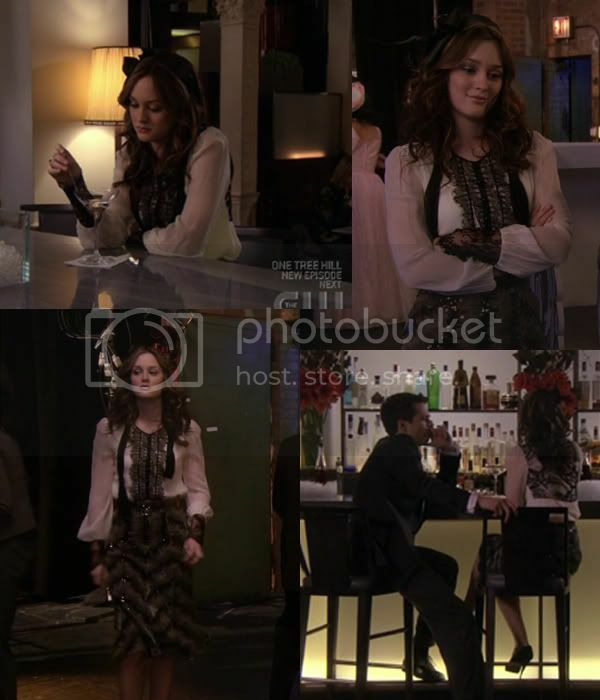 This outfit really stands out among Blair's because of that way that it's lacking her traditional structure. However, I'm guessing that was a very conscious decision on Eric Daman's part considering the content of this scene, so I especially like it. Overall, the look is just amazingly gorgeous, especially the details like the necklace, the flowered belt, and the juxtaposition of ivory lace and black. 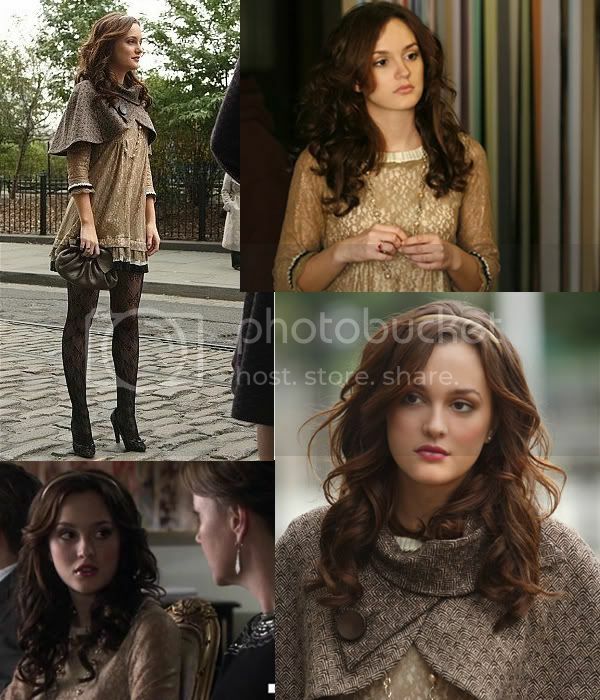 I haven't been a big fan of very much that Blair has worn this season, but I do really like this Burberry dress. (That might have a lot to do with my total obsession with Burberry.) I also love her shoes and how her outfit complements Chuck's. 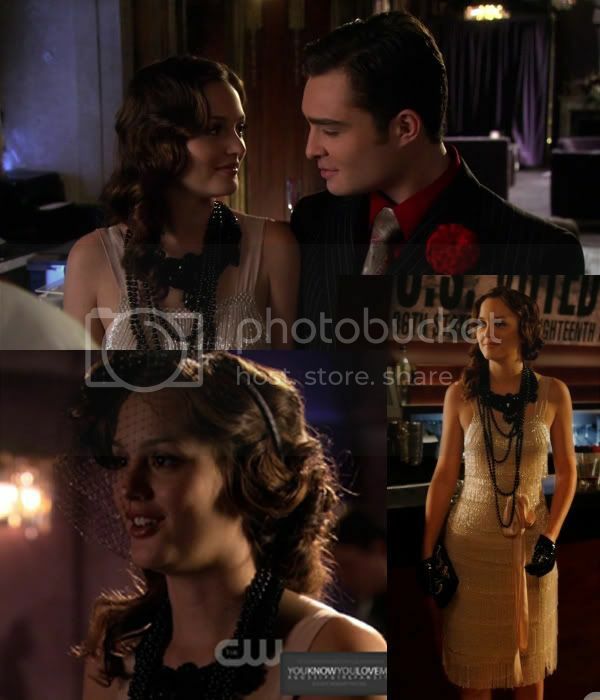 Blair simply rocks the Flapper outfit. And she and Chuck look adorable! I hope you've enjoyed this picspam. It took a long to time to make, so your comments/opinions are greatly appreciated.